Are any snowbirds keeping up with Pender happenings via Jocko’s fabulous blog? It’s a longshot, but if there are any besides me, why not share your snowbirding adventures, locations and tips with other expat-Penderites? I for one arrived in southern California just in time for the horrendous inferno last week. 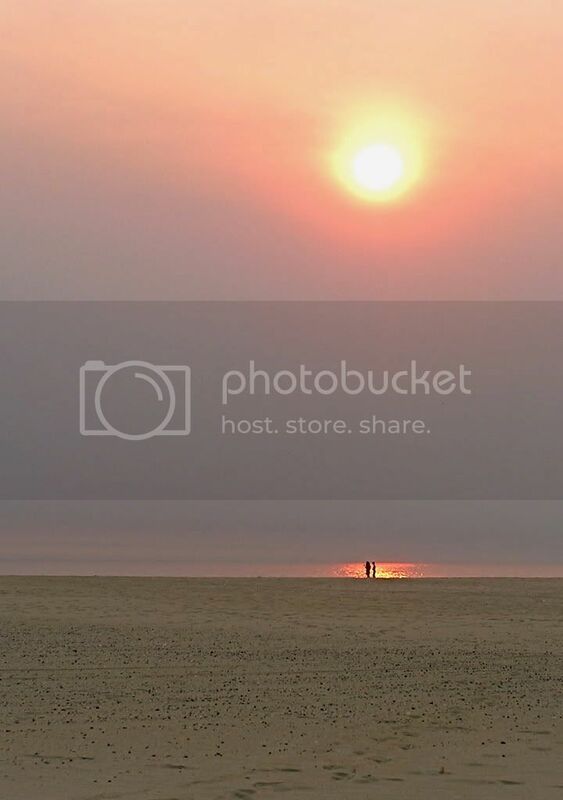 Although there were no fires all that close to where I was in San Clemente (the closest being 10 km away at Camp Pendleton), the air quality remained unhealthful for several days, even at the beach. Things are back to normal now, and if there are any RV’ers who want recommendations on where to go, including fabulous State Park sites right on the beach in southern California, I can advise. Just leave ‘comments’ to this post to communicate. Note: Quantities are approximate, but makes about 25 slices or enough for about 8 people. A mix of red, green and white tortillas add a festive, Mexican flag coloured touch. Mix all ingredients together into a paste. Paste should hold together and not be too soft and definitely not runny. Spread over each tortilla in a layer not more than 1/4 in thick making sure you get right to the edges. Gently roll up tortilla starting nearest you, not too tight. Transfer to a square of plastic wrap and wrap snugly. Repeat procedure until spread is used up. Refrigerate for absolute minimum of 2 hours and preferably 8 hours to overnight. Best rolled and chilled the day before. When thoroughly chilled, unwrap and using a sharp, not serrated, knife cut into 1/2 to 3/4″ thick slices and arrange on a platter either standing up or in a leaning domino arrangement. End slices may be eaten by chef as they will not be perfect enough for the platter. To serve, provide a small center bowl of salsa and a single spoon. This is finger food, so using spoon, add a little salsa to one side of a slice before popping it in your mouth. Small plates might be useful, but a cocktail napkin would do just as well. 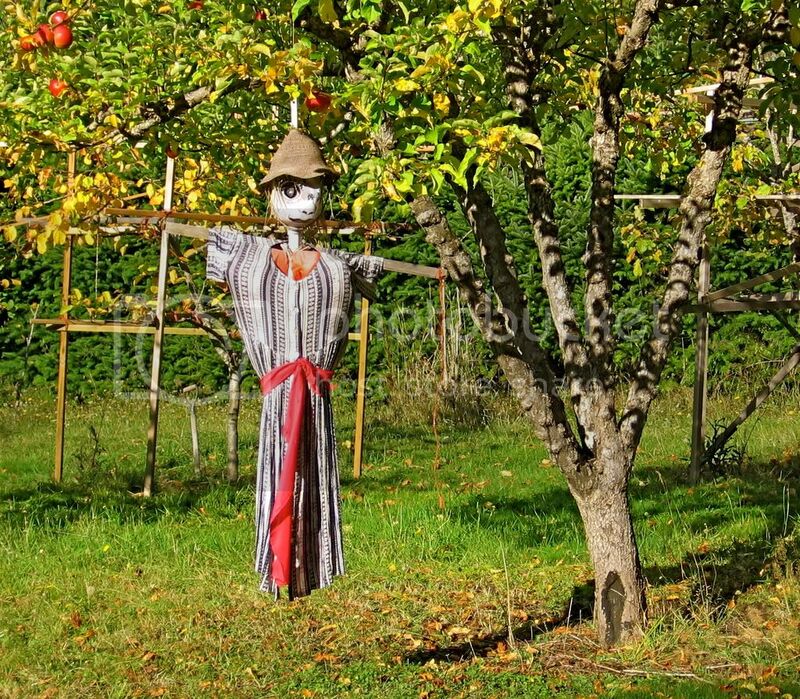 A scarecrow in Port Washington that could actually scare off crows! If you happen to be strolling around the Driftwood center, drop in and have a chat with Gwen at Gwen’s Fine Art & Native Collectibles next to the realty office. Gwen has an interesting background which led her to start a Native art gallery on Pender. Gwen missed her family in Canada and returned to Pender to share a love of Native Indian Culture by opening the store. Gwen can be reached at 629-6647 or visit www.gwensnativecollectibles.com. Check out her store soon! Time for a change on the roads? The Pender Islands have experienced a large population increase over the past few years with a coinciding increase in road traffic. With all means of getting around out there, be it walking or jogging shoes, bicycles, scooters, cars, pick up trucks, large trucks, heavy equipment trailers and commercial vehicles, there is a growing need to rethink the way we use our roads. Factor in the predicted ongoing increase in the price of gas and diesel fuel, most of us will be trying to reduce the use of our vehicles. There will be more walkers, cyclists, and scooters on the road adding to the potential for accidents. A move in the right direction would be towards some kind of community transportation, but with our current population, buses would probably be uneconomical. We could, however, try out “Car Stops”. Car Stops are clearly identifiable places throughout an island, where people can wait, if they wish, to get a lift. The stops would have a Car Stop sign, and a legal disclaimer that would indemnify drivers. The result would be a reduction in single occupancy vehicles, an easing of parking problems at shopping centers, the ferry terminal and halls, safer roads and a possible increase in community spirit. We can do this without huge expenditure. We can do it if we have the will. I was going through some old family photos and came across this. 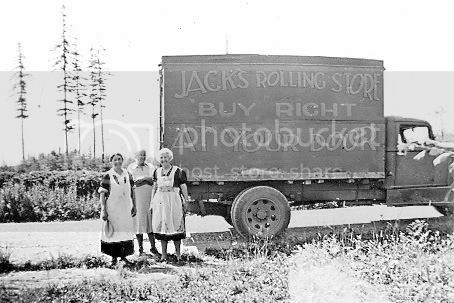 My Grandmother and friends standing by the mobile grocery truck. In rural Saskatchewan back at the turn of the last century, this was a practical and convenient way to serve residents needs. Could this concept be adapted to the islands and reduce individual trips to the store? This is such a brilliant solution to a little problem in my kitchen that I thought I’d share it with the rest of you loyal PenderBlog readers and participants (although we could use a few more of them, come on, you know you want to say something, let it out!). What is that great hint you have? To keep your wooden cutting board clean and fresh, if necessary scrape first with a large butcher knife or Asian cleaver (be careful!) to get any built up stuff off (you know what I mean), and then routinely, ie. 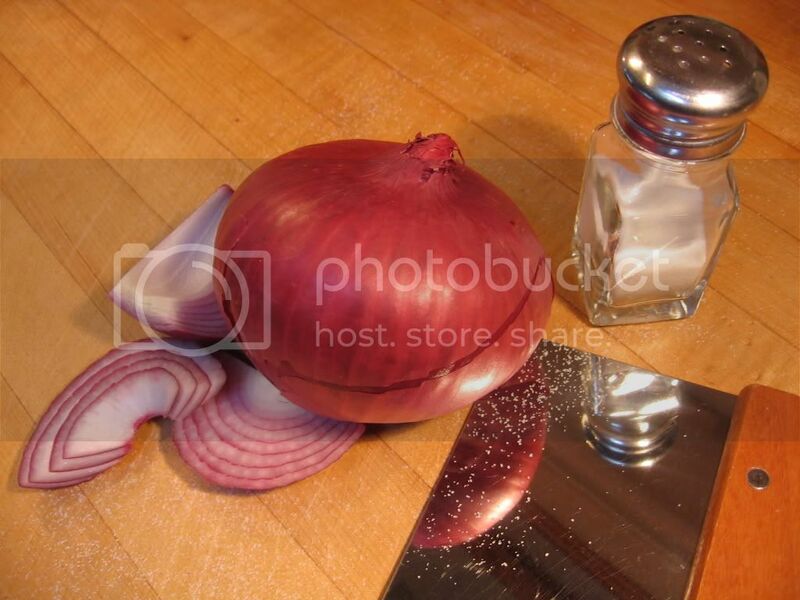 maybe every day or so, wipe it down with a bit of table salt. This will help remove and prevent future buildup of that stuff, maybe sterilize the surface, and season your chopped food all in one step! I also sprinkle some salt on my kitchen cloth at night and roll it up damp and it stays amazingly sweet and fresh. I guess the bacteria don’t like the salt – J.